^ a b "Texas Governor Rick Perry". Office of the Governor, 2011年9月30日閲覧. ^ "Perry's Ancestry" 2012 Republican Presidential Candidates. ^ Jay Root, "Taking a Look at the Governor, Back When He Was a Democrat". The New York Times (2011年7月14日), 2011年10月1日閲覧. ^ Catalina Camia, "Al Gore reflects on Rick Perry." USA Today (2010年9月9日), 2011年10月1日閲覧. ^ 「テキサス州知事に待望論　12年米大統領選で共和党」 MSN産経ニュース (2011.6.25), 2011年9月30日閲覧. ^ Jason McLure, "Perry says slowing carbon emissions hurts US economy." Reuters (2011年10月1日), 2011年10月1日閲覧. ^ Christy Hoppe, "Perry believes non-Christians doomed." The Dallas Morning News (2006年11月6日). (アーカイブ, 2011年10月1日閲覧). ^ Steve Benen, Perry tackles science in N.H.." Washington Monthly (2011年8月18日), 2011年10月1日閲覧. ^ Catalina Camia, "Rick Perry: Evolution is 'theory' with 'gaps'." USA Today (2011年8月18日), 2011年10月1日閲覧. ^ "Gov. Perry’s Remarks at Israel-Palestine Press Conference in New York City." 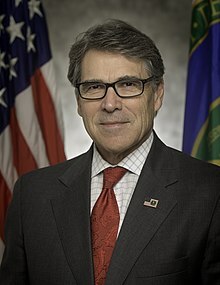 http://www.rickperry.org, 2011年10月1日閲覧.